Having flocks of backyard hens is one kind of investments too, especially if you have a farm. They produce eggs and meat, and bring some fun too. As the return, we should at least provide a comfortable yet safe shelter for them. 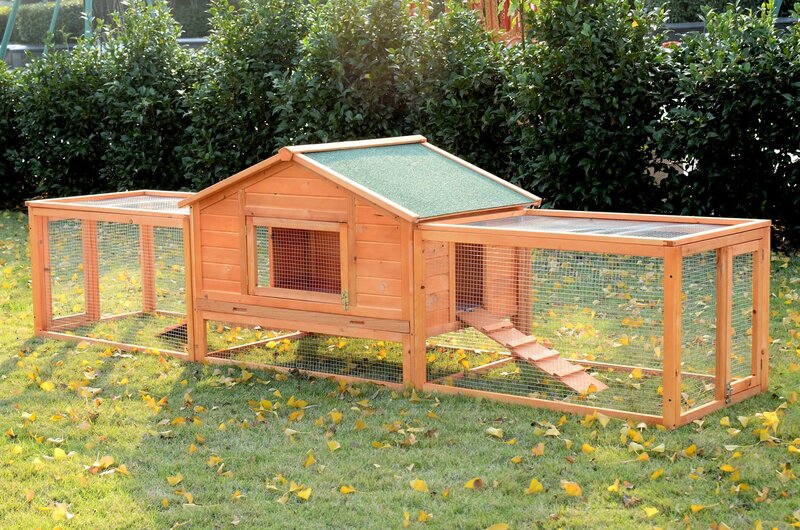 There are many variant of chicken coops, cages, or chicken tractors in the market. My rough measurement is about four square feet per bird. Each of hens need place for lay and perch, so too crowded coop will affect its health and behavior. More chicken means you need to build larger coop. If you are planning to have a big flock, then maybe a large coop will be a best choice so you don’t have to rebuild the coop later. If you live in tropical country, which means the climate is quite wet and hot, you should provide a lot of shade areas. While, if the climate is freezing one, a heater will be needed. Make sure that your flock can survive no matter how the weather outside. There are a lot of predators who loves chicken so much, such as raccoon, foxes, coyotes, dogs, hawks, owls, wolves, or bears. Some rodents like mice also like to disturb chicken, as addition. To keep your flock out of these predators reach, you will need a coop that can protect the flock for you. A coop with run or external door can help you deal with them. Also, you can put some electronic wire surrounding the coop. If you have a cat or a dog, it can be your great assistant. A cat can crawl under and eliminate any rodents. A livestock dog is definitely wise decision if you want to get a safe chicken coop outside. Just make sure that your dog is not the one who chase after chicken. Chicks are much cheaper than full grow hen. However, it need place to live and you need to breed it for some weeks, which end up to larger chicken coop and cost you more. You can use re-purposed building materials to reduce the cost. Remember to make note for the all costs so you know how much you spend for the coop. For some reasons, I prefer to buy a pre-made chicken coop than to build one. There are many stores that offer a high quality coop with beautiful design yet not too expensive. It is true that the build one can meet all your requirements better but sometimes it can costs you an arm and a leg. You build the chicken coop on your land, so what is the big deal? If you live in city with neighbors surrounding you, then you must respect them by choosing coop that’s easy on the eye. What a Chicken Coop Should Has? The door should be near the nesting boxes, so it will ease you to collect eggs. You need an easy access to put feeding and water as it will become daily chores. Another way is, you can hang feeders and waterers six to ten inches from the ground. This way won’t allow the chickens roosting above it or sleeping on it. Regularly cleaning on the coop every few weeks will increase the chickens’ health. You can put a tray under the roosting poles as there is where usually poops accumulate. The absence of the floor also can be a good option because it allows you to move the coop around. When you need to clean the underneath, just move it to other area and place it back when you are done. You can use wire and hardware cloth for the wall and use solid floor for burrowing invaders. Place your guardian dogs to make other predators afraid to attack. Surround the coop with electric wire if you think you need it. The shelter should have a waterproof top and solid and thick wall. The chickens need this especially if you live in area with wet climate. Without nesting boxes, how you expect the chickens will lay eggs for you. So, start from beginning, you should consider area for nesting boxes in the coop plan. A nest box can be use for every 4-5 hens. It should at least 2-4 inches from the ground and placed in dark and comfortable corner. Laying hens usually love roosting poles so you should have it in the shelter. Use at least 2 inches wide pole with 5 inches of spaces per bird. If you use more than one roosting pole then placed it 10 inches apart. Keep the balance between allowing air flow freely from outside and keep the flock warm inside. Have at least one window for the coop to ensure the chicken get enough fresh air. If your coop is big one, then you must have two or three windows.